, an ingenious English writer, was born in London Sept. 2, 1705, of a Somersetshire family; his father was a merchant, his mother was Judith, daughter of Abraham Tillard, esq. 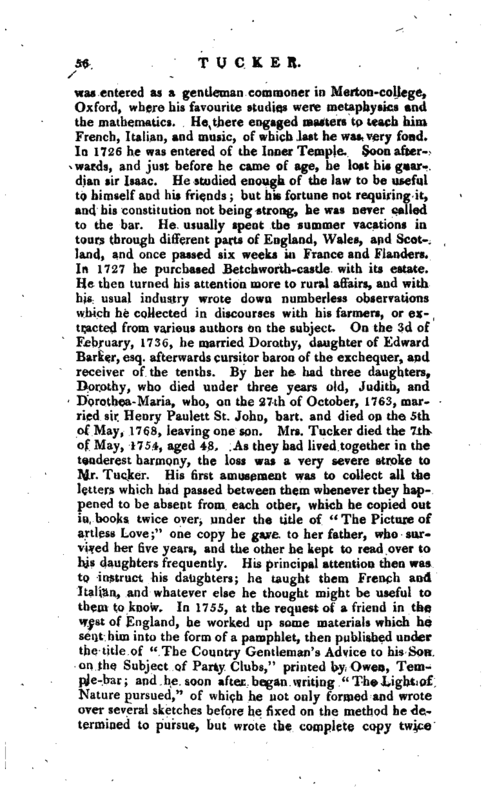 Both his parents died before he was two years old, and left him under the care of his grandmother Tillard and his maternal uncle sir Isaac Tillard, a man of strict piety and morality, of whose memory Mr. Tucker always spoke with the highest veneration and regard, and who took the utmost pains to give his nephew principles of integrity, benevolence, and candour, with a disposition to unwearied application and industry in his pursuits. He was educated at Bishop’s Stortford, and in 1721 | was entered as a gentleman commoner in Merlon-college, Oxford, where his favourite studies were metaphysics and the mathematics. He there engaged masters to teach him French, Italian, and music, of which last he was very fond. In 1726 he was entered of the Inner Temple. Soon afterwards, and just before he came of age, he lost his guardian sir Isaac. He studied enough of the law to be useful to himself and his friends; but his fortune not requiring it, and his constitution not being strong, he was never called to the bar. He usually spent the summer vacations in tours through different parts of England, Wales, and Scotland, and once passed six weeks in France and Flanders. In 1727 he purchased Betchworth-castle with its estate. He then turned his attention more to rural affairs, and with his usual industry wrote down numberless observations which he collected in discourses with his farmers, or extracted from various authors on the subject. On the 3d of February, 1736, he married Dorothy, daughter of Edward Barker, esq. afterwards cursitor baron of the exchequer, and receiver of the tenths. By her he had three daughters, Dorothy, who died under three years old, Judith, and Dorothea- Maria, who, on the 27th of October, 1763, married sir Henry Paulett St. John, bart. 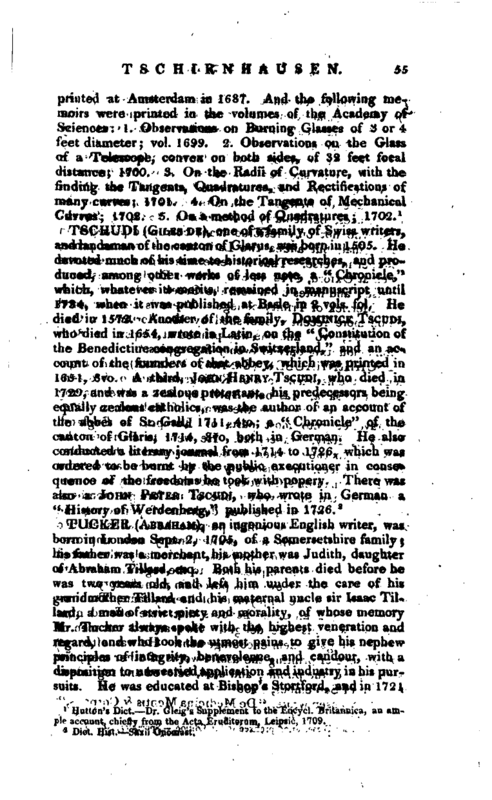 and died on the 5th of May, 1768, leaving one son. 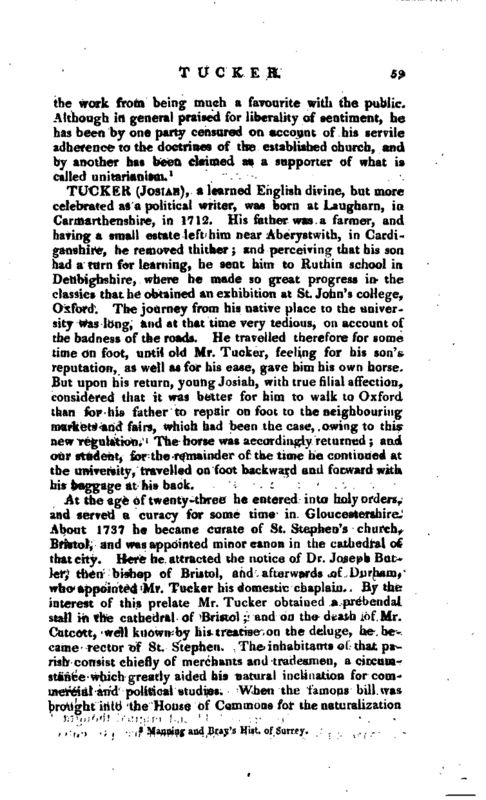 Mrs. Tucker died the 7th of May, 1754, aged 48. As they had lived together in the tenderest harmony, the loss was a very severe stroke to Mr. Tucker. His first amusement was. to collect all the letters which had passed between them whenever they happened to be absent from each other, which he copied out in books twice over, under the title of “The Picture of artless Love;” one copy he gave to her father, who survived her five years, and the other he kept to read over to his daughters frequently. His principal attention then was to instruct his daughters; he taught them French and Italian, and whatever else he thought might be useful to them to know. In 1755, at the request of a friend in the west of England, he worked up some materials which he sent him into the form of a pamphlet, then published under the title of “The Country Gentleman’s Advice to his Son on the Subject of Party Clubs,” printed by Owen, Temple-bar; and he soon after began writing “The Light of Nature pursued,” of which he not only formed and wrote over several sketches before he fixed on the method he determined to pursue, but wrote the complete copy twice | with his own hand; but thinking his style was naturally still and laboured, in order to improve it, he had employed much time in studying the most elegant writers and orators, and translating many orations of Cicero, Demosthenes, &c. and, twice over, “Cicero de Oratore.” After this he composed a little treatise called “Vocal Sounds,” printed, but never published; contriving, with a few additional letters, to fix the pronunciation to the whole alphabet in such manner, that the sound of any word may be conveyed on puper as exactly as by the voice. His usual method of spending his time was to rise very early to his studies, in winter bu ‘ning a lamp in order to light his own fire before his servants were stirring. After breakfast he returned to his studies for two or three hours, and then took a ride on horseback, or walked. The evenings in summer he often spent in walking over his farms and setting down his remarks; and in the winter, while in the country, reading to his wife, and afterwards to his daughters. In London, where he passed some months every winter and spring, he passed much time in the same manner, only that his evenings were more frequently spent in friendly parties with some of his relations who lived near, and with some of his old fellow collegiates or Temple friends. His walks there were chiefly to transact any business he had in town, always preferring to walk on all his own errands, to sending orders by a servant, and frequently when he found no other, would walk, he said, to the Bank to see what it was o’clock. Besides his knowledge in the classics and the sciences, he was perfectly skilled in merchant’s accompts, and kept all his books with the exactness of an accompting-house; and he was ready to serve his neighbours by acting as justice of peace. 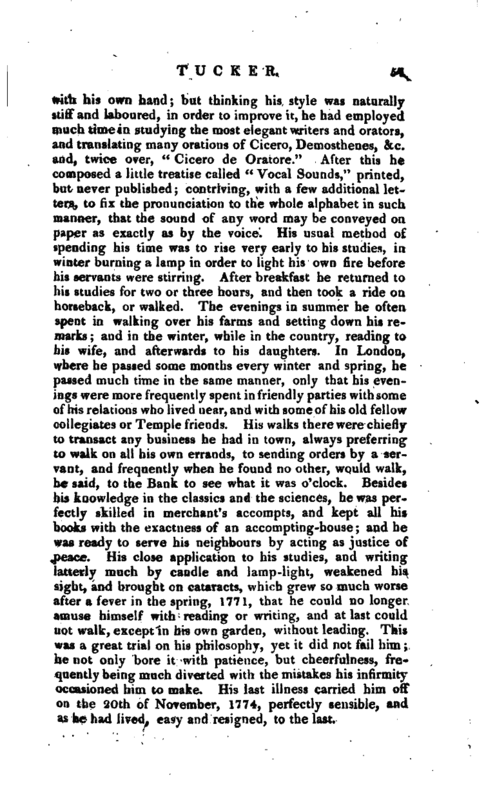 His close application to his studies, and writing latterly much by candle and lamp-light, weakened his sight, and hrought on cataracts, which grew so much worse after a fever in the spring, 1771, that he could no longer amuse himself with reading or writing, and at last could not walk, except in his own garden, without leading. This was a great trial on his philosophy, yet it did not fail him i he not only bore it with patience, but cheerfulness, frequently being much diverted with the mistakes his infirmity occasioned him to make. His last illness carried him off on the 20th of November, 1774, perfectly sensible, and as he had lived, easy and resigned, to the last. | He published a pamphlet entitled a Man in quest of himself,“in reply to some strictures on a note to his” Free Will.“He had no turn for politics or public life, and never could be induced to become a candidate to represent the county of Surrey, to which his fortune, abilities, and character gave him full pretensions.” My thoughts,“says Mr. Tucker of himself,” have taken a turn, from my earliest youth, towards searching into the foundations and measures of right and wrong; my love for retirement has furnished me with continual leisure; and the exercise of my reason has been my daily employment." 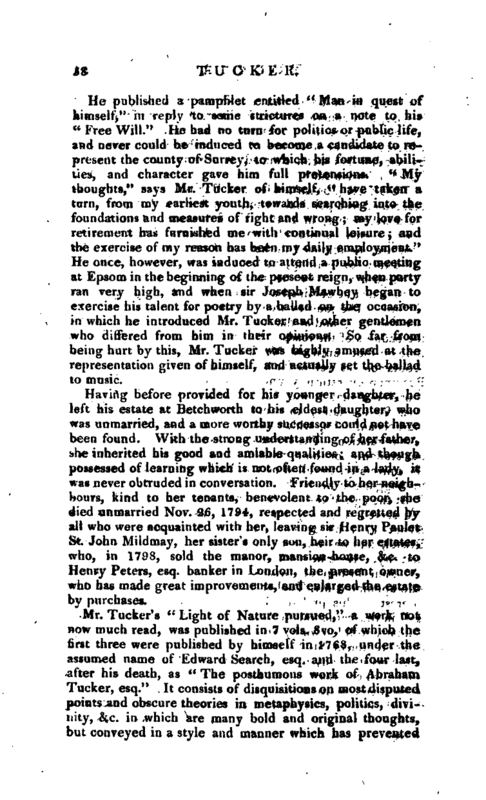 He once, however, was induced to attend a public meeting at Epsom in the beginning of the present reign, when party ran very high, and when sir Joseph Mawbey began to exercise his talent for poetry by a ballad on the occasion, in which he introduced Mr. Tucker and other gentlemen who differed from him in their opinions. So far from being hurt by this, Mr. Tucker was highly amused at the representation given of himself, and actually set the ballad to music. Having before provided for his younger daughter, he left his estate at Betchworth to his eldest daughter, who was unmarried, and a more worthy successor could not have been found. With the strong understanding of her father, she inherited his good and amiable qualities; and though possessed of learning which is not often found in a lady, it was never obtruded in conversation. Friendly to her neighbours, kind to her tenants, benevolent to the poor, she died unmarried Nov. 26, 1794, respected and regretted by all who were acquainted with her, leaving sir Henry Paulet St. John Mildmay, her sister’s only son, heir to her estates, who, in 1798, sold the manor, mansion-house, &c. to Henry Peters, esq. banker in London, the present owner, who has made great improvements, and enlarged the estate by purchases. 1 Manning and Bray’s Hist, of Surrey.